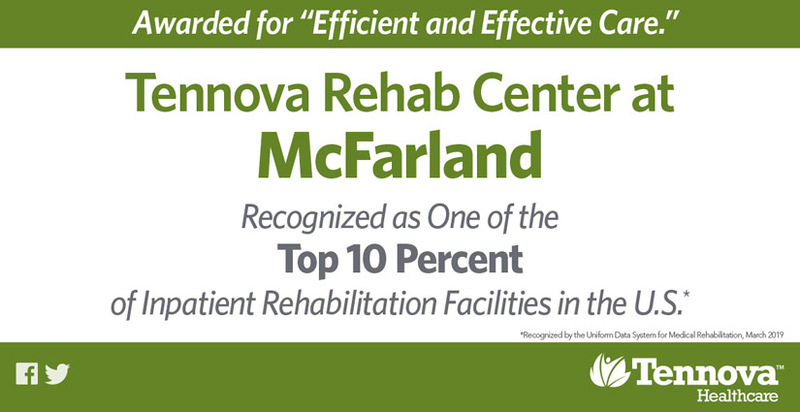 Tennova Rehab Center at McFarland is committed to helping people enhance their quality of life and achieve optimal independence. Our inpatient rehabilitation center provides a supportive, caring environment that emphasizes each patient’s abilities rather than disabilities. We strive to instill our patients with the confidence they need for a full recovery. Rehabilitation at Tennova Rehab Center at McFarland is a combination of assessment, treatment, education and follow-up. It focuses on the physical as well as emotional and spiritual needs of each patient and family. Assessment - Upon admission, the interdisciplinary team will assess each patient’s current status, medical history and lifestyle. The results of the evaluation, along with the patient’s personal goals, are used to create an individualized treatment plan. Treatment - Treatment may focus on mobility, self-care, cognition, communication, independent living skills, medical needs and psychological adjustment. Treatment plans are managed by a team of healthcare professionals experienced in rehabilitation medicine. Team conferences are conducted on a weekly basis, assessing the patient’s progress, barriers and plan toward meeting the patient’s discharge goals. Education - Each patient’s treatment plan includes education on topics that are specific to his or her diagnosis and needs. Family members are also educated on their loved one’s disease or impairment, potential complications, and post-discharge follow-up needs, such as support groups and community resources. Follow-up - Prior to discharge, the rehabilitation team will work with the patient and family to ensure a successful transition home. Patients will receive follow-up phone calls after discharge to make sure they are progressing with their recovery and to address any remaining needs. Access to a continuum of outpatient therapy programs and home healthcare services. For more information or to initiate a referral, please call 615-443-6807. Download our brochure to learn more about our center.